Braided resin lounge armchair indoor or outdoor. It will be perfect on your terrace, in your veranda, your winter garden, even around the swimming pool! French design and Retro style, practical (stackable!) Never used. Two midcentury rattan armchairs red and black, Italy Lunghezza: 86.00 M Larghezza: 76.00 M Altezza: 80.00 M.
Antique iron metal base lounge chair with scrolled arm and loose cushions and webbing support. Extremely comfortable and inviting. Measures: Arm height 25". 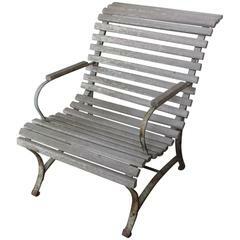 French garden chair, weathered wooden slats on a rusted painted iron frame. A pair of wrought iron armchairs embellished with chains.